We’re a city that takes famousness in our stride – and thoroughly ignores celebrity. Well, at least I am. I’ve lived in the same street as one of the Hobbits, and studiously gave him no more than a surly eyebrow/chin nod when out walking the dog. I’ve been in a line at a petrol station next to Bofur the dwarf, and didn’t so much as sniff his petrol docket. I’ve had dinner on the table next to one of the Conchords, or maybe both – and spoke to them less than I spoke to the waiter. It’s what we do in Wellington – when famous people want privacy, we give them it in spadefuls. There’s nothing that turns a celebrity into a recluse more than hordes of screaming school kids. So, in future, tiny people greeting celebs – be cool. So I’m going to ignore the presence of the Prince and the Pantsuit, and go straight to the point of the Pukeahu Park – the memorials to those who have died. I was one of those people who was aghast at the original government plans to keep the road running through at ground level – the most stupid of ideas – and I’m glad that the scheme was changed so that the highway now runs in a tunnel underneath. It has been interesting to see how the Park has been steadily populated by memorials – with the NZ Memorial in pride of place at the centre, Australia’s totems directly opposite being the only two items there at the start. Since then of course it has been joined by the British memorial and it’s odd / ugly Weta-derived tree, next to Paterson’s clever and much quieter French stone sculptures. Down the other end we now have the extraordinary rusting wreath of ferns-in-a-torus that is the Belgian memorial, and soon to be unveiled will be the US memorial. Time for a longer look on 11 November methinks. I want to know what’s going to happen when the LGWM people come back and say they are going to dig the whole thing up again, for the road coming the other way. Have they thought of that yet ? 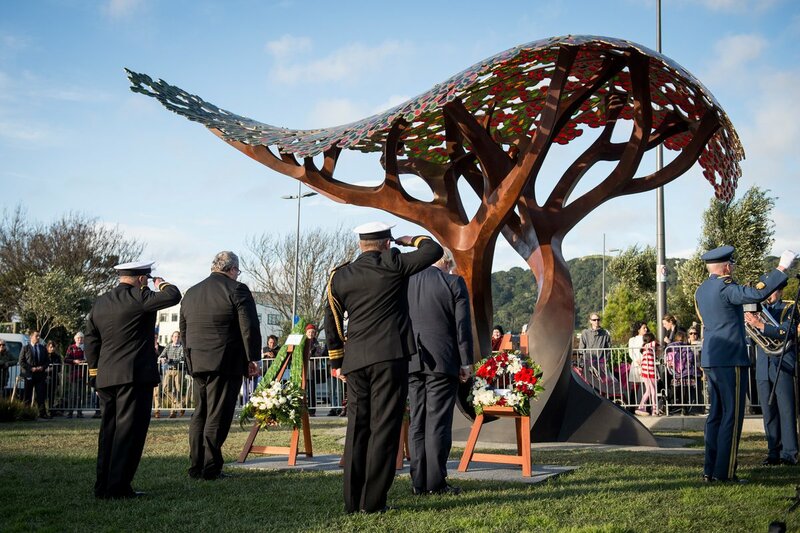 The Turkish memorial is small, just to the west of the Aussie one – see https://mch.govt.nz/pukeahu-park/turkish-memorial. Meanwhile Greece still suffers the ignominy of having a memorial sandwiched between two main roads including SH1…. thanks Betterbee – yes of course. I’m hugely proud that we have installed a Turkish monument – after all, the Turks have accommodated thousands of visiting Kiwis and Aussies on their peninsula every year. greenwelly – aaaah, the Greek question. I hear it keeps having bits of stone nicked off it – not very respectful. Do you really think it should be moved? 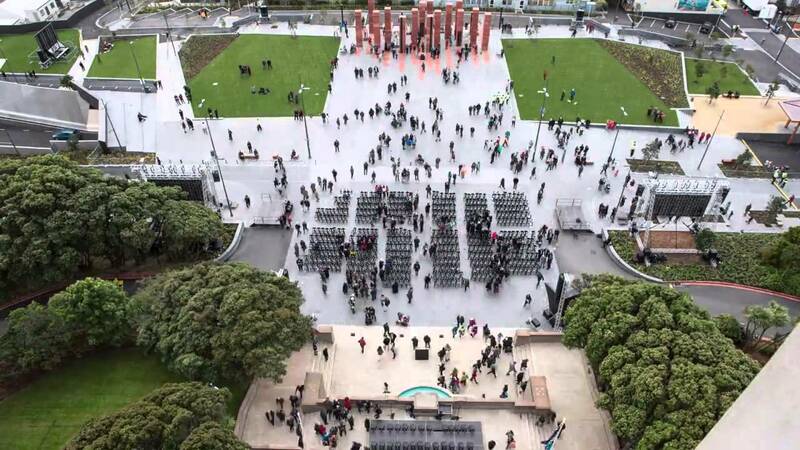 Can’t really move it up to Pukeahu, as it is quite large… and might take over half the Park…. but it is probably also quite good where it is, in line of sight from the Greek community still resident on Mt Victoria. Alan – you’re absolutely right – that’d be rather awkward. But is that a good enough reason not to ? 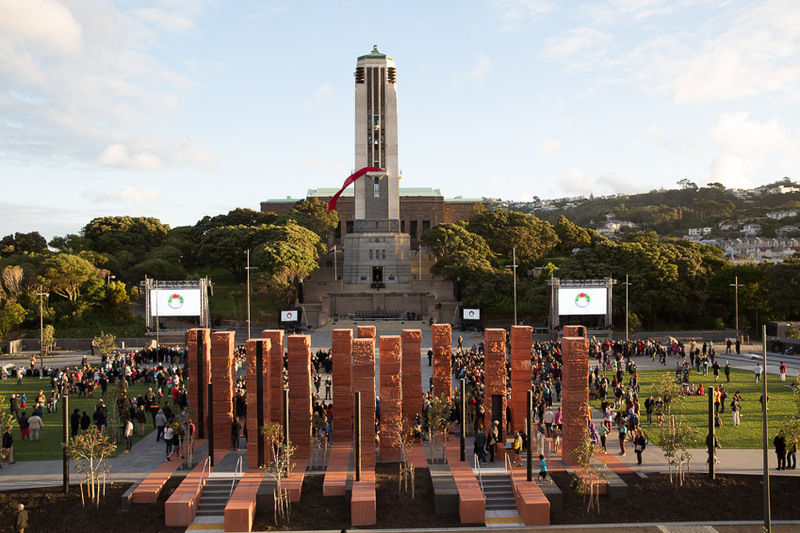 Hadn’t thought of moving the Greek memorial to Pukeahu – excellent idea (at least in principle), greenwelly! NZ Land Wars being top of the pile. We have Britain, France, Australia and soon USA, but what about our other allies? Czechs and Slovaks ? And other slavs despoiled by Hitler? India? Indians were also at Gallipoli in large numbers, they are the “untold” story. Hong Kong? That was a British colony, attacked by Japanese and suffered heavy naval losses. Russia ? Remember, they were our friends against the Nazis back then – and suffered the worst losses of any country. Korea / Vietnam / Cambodia? Iraq / Iran / Afghanistan ? Careful not to tread on any fingers and toes…. its a tricky situation out there. But if, for instance, Angela Merkel arrived here for a visit, she would no doubt visit the War Memorial Park as well. Should she just lay a wreath, or should there be a memorial to those Germans who died – some of which we (kiwis) killed?